Weather: Windy, high of 75 today; storms possible Wednesday night – Welcome to Wyandotte Daily! 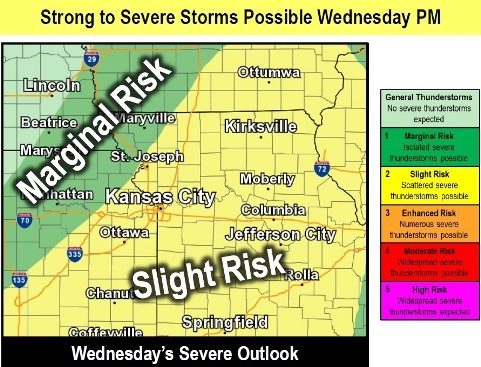 A warm front today with a high of 75 and winds of 11 to 16 mph will give way to a cold front on Wednesday night, with possible rain, hail and damaging winds, according to the National Weather Service forecast. Rain could persist on Thursday and Thursday night, then a weekend in the 70s is in the forecast for Saturday and Sunday, the weather service predicted. There is also a possibility of the Missouri River rising toward the end of the week. 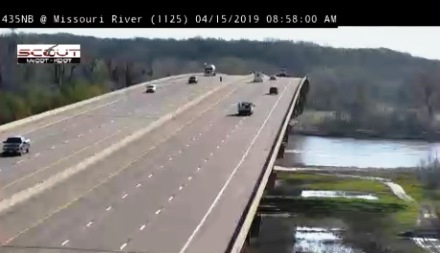 At the Missouri River at Parkville, which includes Kansas City, Kansas, the river is currently below flood stage and could rise into action stage later this week. Today, it will be sunny with a high near 75 and a south wind of 5 to 10 mph, increasing to 11 to 16 mph in the afternoon, the weather service said. Winds may gust as high as 26 mph. Tonight, the low will be around 56 with a south wind of 11 to 14 mph, gusting as high as 24 mph, according to the weather service. Tuesday night, it will be mostly cloudy with a low of 62 and a south wind of 11 to 15 mph, gusting to 22 mph, according to the weather service. Wednesday, there is a 30 percent chance of precipitation and thunderstorms, mainly after 1 p.m., with a high near 77, the weather service said. A south wind of 13 to 16 mph will gust as high as 29 mph. Less than a tenth of an inch of rain is possible. Wednesday night, there is a 70 percent chance of showers and thunderstorms, with a low of 49, according to the weather service. Between a half and three-quarters of an inch of rain is possible. Thursday, there is a 50 percent chance of showers, with a high near 57, the weather service said. Thursday night, there is a 30 percent chance of showers before 1 a.m., with a low of 43, according to the weather service. Friday, it will be mostly sunny, with a high near 63, the weather service said. Friday night, the low will be around 43 with mostly clear skies, according to the weather service. Saturday, it will be sunny with a high near 70, the weather service said. Saturday night, the low will be around 53 with mostly clear skies, according to the weather service. Sunday, it will be mostly sunny with a high near 75, the weather service said.